Can your idea meet a market need? Are you hindered by lack of capital? Stand a chance to win N300k to jumpstart your business. 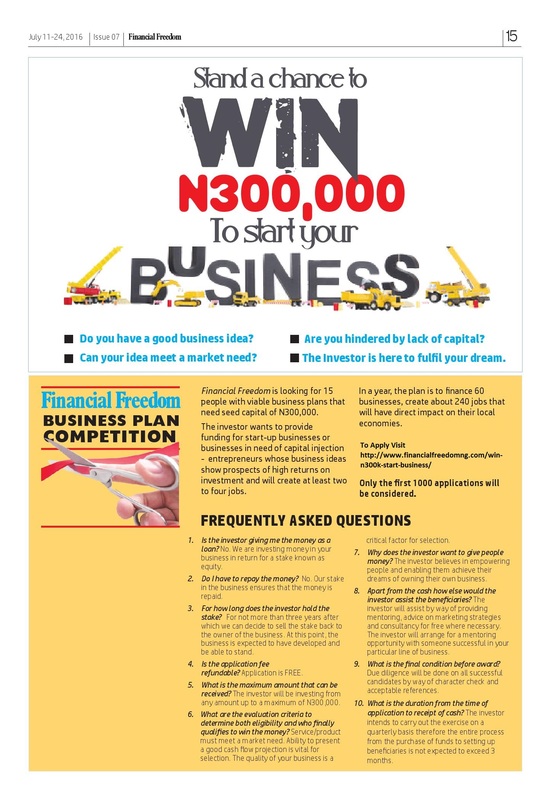 FINANCIAL FREEDOM is looking for 15 people with viable business plans that need seed capital of N300k. The Investor wants to provide funding for start-up businesses or business in need of capital injection to entrepreneurs with brilliant ideas and whose business ideas show prospects of high Return on Investment and able to create at least 2 to 4 jobs. In a year, the plan is to finance 60 businesses, create about 240 jobs that will have direct impact on their local economies. ONLY THE FIRST 1000 APPLICATIONS WILL BE CONSIDERED. Que: Is the investor giving me the money as a loan? Que: Do I have to repay the money? Que: For how long does the investor hold the stake? Que: Is the application fee refundable? Que: What is the maximum amount that can be received? Ans: The investor will be investing from any amount up to a maximum of N300k. Que: What are the evaluation criteria to determine both eligibility and who finally qualifies to win the money? Ans: Service/product must meet a market need. Ability to present a good cash flow projection is vital for selection. The quality of your business is a critical factor for selection. Que: why does the investor want to give people money? Ans: The investor believes in empowering people and enabling them achieve their dreams of owning their own business. Que: Apart from the cash how else would the investor assist the beneficiaries? Ans: The investor will assist by way of providing mentoring, advice on marketing strategies and consultancy for free where necessary. The investor will arrange for a mentoring opportunity with someone successful in your particular line of business. Que: What is the final condition before award? Ans: Due diligence will be done on all successful candidates by way of character check and acceptable reference. What is the duration from the time of application to receipt of cash? Ans: The investor intends to carry out the exercise on a quarterly basis therefore the entire process from the purchase of funds to setting up beneficiaries is not expected to exceed 3 months.